The second major expansion to Forza Horizon 3 released today on Xbox One and for Windows 10. Joining Blizzard Mountain – which itself was a great addition to Forza Horizon 3 when it released in late 2016 – is the new licensed Hot Wheels expansion pack. 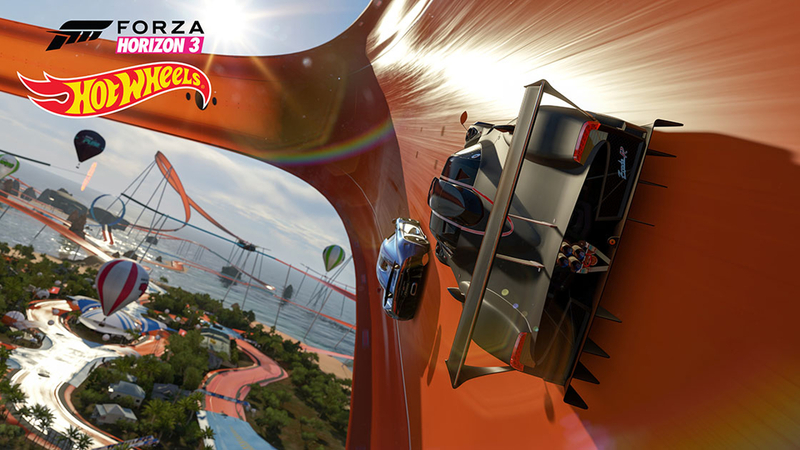 Hot Wheels includes six themed mountains connected by the iconic orange tracks and 10 new vehicles. Check out the full list of new cars that are included here. The Forza Horizon 3 Hot Wheels expansion is the ultimate playground for cars! Located off the coast of Australia, this chain of islands is here to make your Hot Wheels fantasies come to life with loops, corkscrews, boost pads, high bank turns, half-pipes, insane jumps – and even mechanical dinosaurs! Race ten new cars including Hot Wheels icons like the Twin Mill and Boneshaker. Create custom Hot Wheels events by swapping out stunt track sections and dare your friends to try them. Also included is a new hidden barn find car to discover, new Xbox Live Achievements, new Bucket Lists, Rivals, new multiplayer arenas and more. The Hot Wheels DLC is priced at $20 on its own or is included in the Expansion Pass which is currently being sold for $35 and would include Blizzard Mountain. Look for a review of the new Hot Wheels expansion early next week!